Make plans now to join in. Host Hotel is the Tampa Marriott Westshore, Tampa FL for $119.00 USD per night. Click to make your reservations. USAir became a company created by mergers involving several airline companies which brought effective resources to the system in the form of routes, equipment and well qualified employee groups. The management team developed by Mr. Leslie O. Barnes began a movement toward a growth pattern developing into one of the largest and most efficient airlines in the world. Mr. Barnes was succeeded by Edwin I. Colodny as President and Chairman. Mr. Colodny established a great management team that included Mr. Seth "Butch" Schofield, the eventual President and Chairman. These officers took advantage of opportunity to grow and prosper. Mergers were brought to completion that considered the welfare of all employees in addition to strengthening the airline marketplace standing. Allegheny, Lake Central, Mohawk, Pacific Southwest, Piedmont are the airlines that formed USAir. This website is intended to recognize the contribution made by Employees and Managers who built the USAir Airline Company. It is with a very heavy heart that I report that my long time friend of 64 years, my Brother in Law and Retired Captain Russel N. Gries boarded his last flight Arrangements are incomplete at this time and will be sent when they become available. Condolences may be sent to his Daughter Nicole Rabner 1059 Beachwood Blvd. Pittsburgh, Pa. 15206. Member dues are now payable January 31 each year. Current REGULAR dues $40.00, Members age 80 by January 31st dues are reduced to $25.00. Remember to include an update of your status. A new service for our membership. We hope this service makes it easier to stay current as a Soaring Eagle. Captain Paul Sturpe, 8860 Peninsula Drive, Terrell, NC 28682. 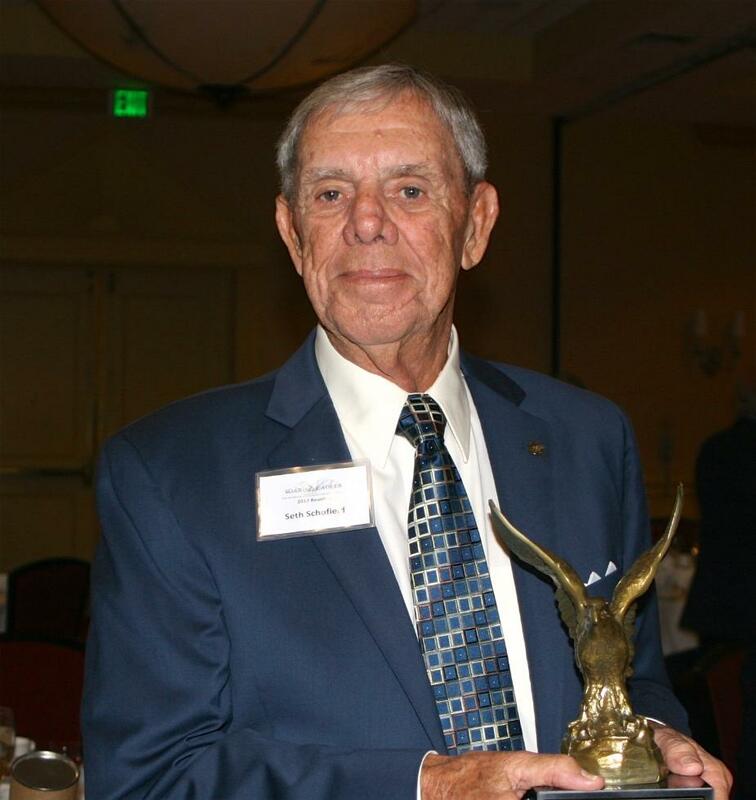 Retired Chairman Ed Colodny accepts his Eagle Award from the Soaring Eagles in recognition of his outstanding service to USAir and the employee groups. Mr. Colodny's appreciation is obvious. 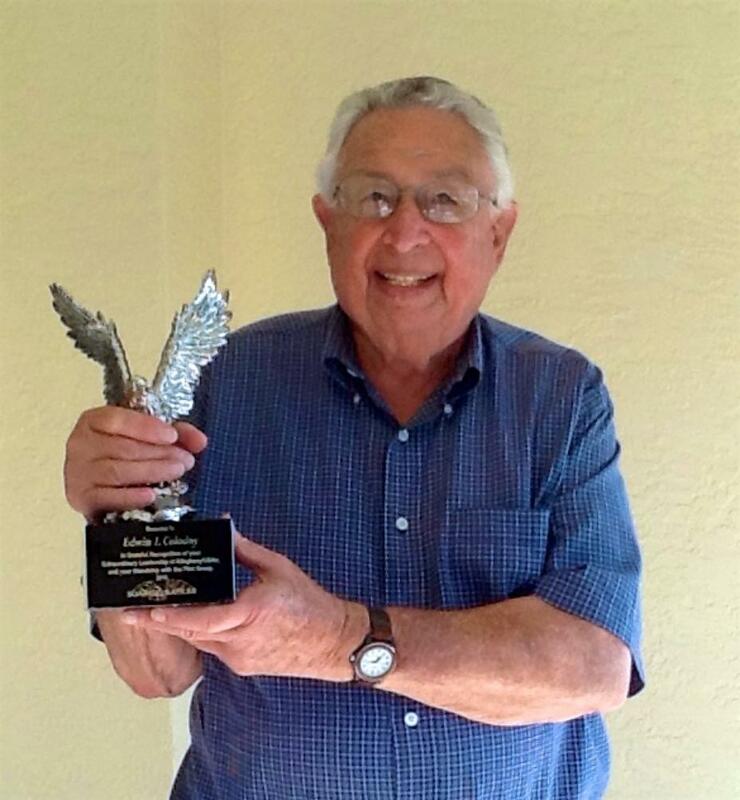 Retired Chairman and CEO Seth "Butch" Schofield displays his Soaring Eagles Award recognizing his outstanding service to USAir Airline and the employee groups. 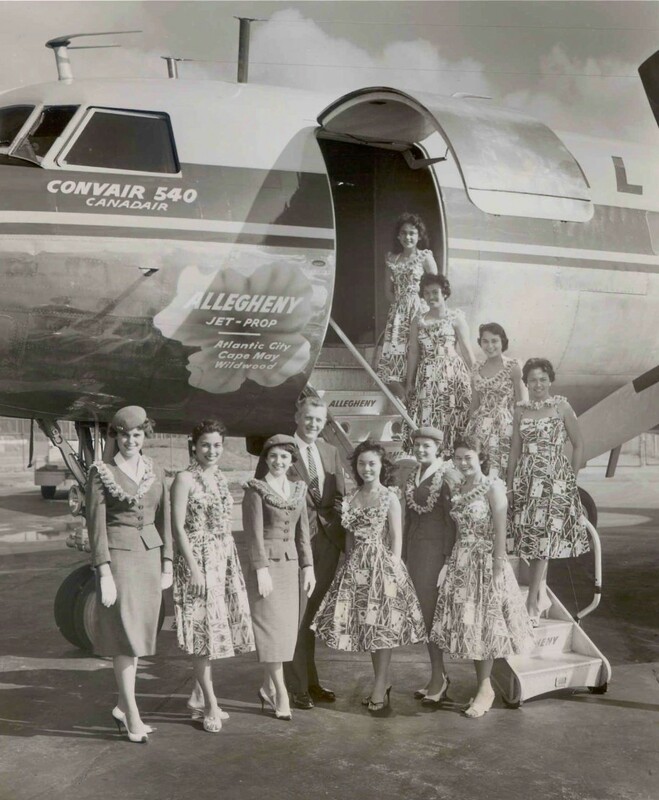 Chairman Leslie O. Barnes and Flight Attendants introduce modern jet prop service using the Napier powered Convair. The Napier powered Convair was short lived. It was replaced by the Allison powered 580 Convair. The seven Flight Attendants wearing the bright colored outfits were on loan from Hawaii as a promotional plan for the service.